Elektron’s Digitakt may be small, affordable, and friendly. 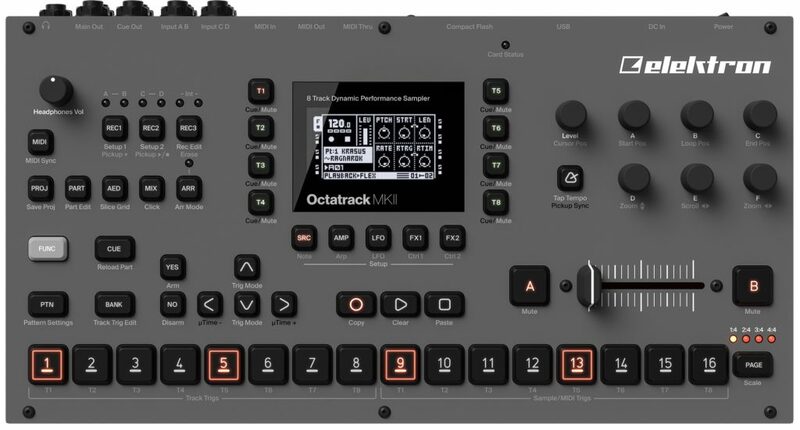 But Elektron followers couldn’t help noticing some features missing from the flagship Octatrack. The more elaborate sample mangling and manipulation features, plus advanced routing architecture, not to mention the crossader and signature form factor were gone. In other words, the Digitakt is cool, but it isn’t an Octatrack. Gee, it almost seems like they were differentiating the Digitakt from a forthcoming Octatrack MKII. Well, here it is: it’s the Octatrack MKII. Versus the cheaper Digitakt, you get deeper sampling capabilities (as on the original Octatrack). There’s instant stereo sampling with real-time pitch shift and time stretch. There’s the assignable crossfader, which is essential to the Octatrack’s performance capabilities. There’s deeper assignments: three LFOs per track, two effects slots. And Octatrack MKI owners can upgrade easily, since you can import your old projects. But then, that raises a question: is there enough here for MKI owners to upgrade? There are more dedicated buttons. One of the issues with the original Octatrack was the amount of menu-diving – and a lot of users simply didn’t grok the shortcut keys on the first model. There are balanced audio inputs. There’s a new “contactless, silky smooth” crossfader. And… that’s it. Maybe. Elektron haven’t said more about what the details of the OS might provide over the original, so we’ll have to learn more there. For now, it looks like there are some notable missing features: updates to MIDI assignment, effects, and most notably, Elektron’s Overbridge technology for connection to computers see no mention. That’s a good news/bad news situation. The bad news is, yeah, you don’t see Overbridge or any updates to the Octatrack’s capabilities. Availability: August, €1449/$1349. That’s steeper than the AKAI MPC Live, but Elektron’s build quality is exceptional, and they’ve sometimes proven to loyalists that less can be more as far as features. It’s also still cheaper than Pioneer’s standalone drum machine/sampler.